석가의 모습이 단독으로 그려진 괘불로, 괘불이란 야외에서 큰 법회나 의식을 진행할 때 예배의 대상으로 사용하던 대형 불교그림을 말한다. 이 그림은 가로 4.5m, 세로 9m의 크기로 거대한 화면에 꽉 차게 정면을 향하여 서 있는 석가의 모습을 그렸다. 석가는 보살처럼 화려한 장식을 하고 머리에 보관을 쓰고 있다. 얼굴은 비교적 풍만하고 이목구비는 작고 가늘지만 근엄한 표정을 짓고 있으며 우람한 체구와 좌우로 벌린 발이 인상적이다. 녹색과 붉은색이 선명하게 대비되는 옷은 다소 무거운 느낌을 주는데, 특히 둥근 장식과 꽃무늬들은 이 그림을 한층 더 장엄하고 정교해 보이도록 한다. 조선 영조 1년(1725)에 그려진 이 그림은 전체적으로 약간 바래지고, 떨어져나간 부분도 있지만 보존상태가 양호한 편으로 화려한 보살모습을 한 석가모니불을 그린 당대를 대표하는 괘불로 손꼽을 수 있는 작품이다. Gwaebul refers to a large Buddha painting used as an object of worshipping when a Buddhist worship service or ritual was conducted outdoors. The painting measures 4.5 m wide and 9 m long. 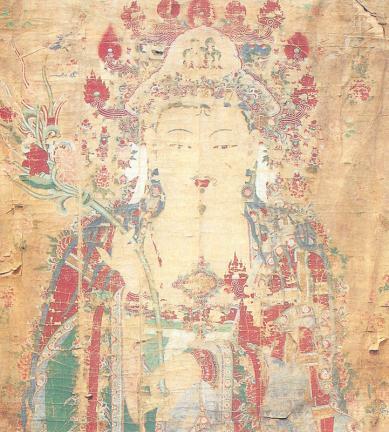 Buddha, who is standing and looking straight ahead, is depicted on white canvas. The Buddha is wearing splendid ornaments as well as a coronet on the head like Bodhisattva, a Buddhist saint. His face looks relatively round, with small, thin facial features. He gives a serious impression and has a stout physical build. His posture with his feet spread left and right looks impressive. His robe, depicted with red and green contrasting colors, looks a little heavy. In particular, the round ornaments and flower patterns on the robe make it look much more grandiose yet elaborate. 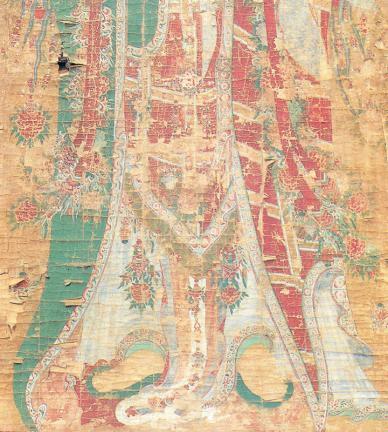 The painting was made in the 1st year of King Youngjo’s reign (1725) so it looks faded overall and has partial damage, but it is well-preserved. It is considered the best Gwaebul of that time.